KARACHI (92 News) – The Opposition leaders in the Sindh Assembly have on Tuesday demanded to move condemnation resolution against Speaker. 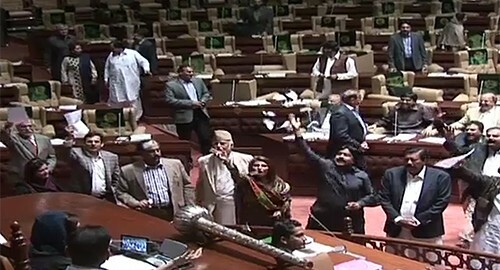 The Sindh Assembly session on Tuesday witnessed ruckus again as usual, while the opposition leaders demanded the condemnation resolution be moved in the assembly against Speaker. Shehla Raza strongly opposed but the opposition leaders tear down the copies of agenda. During the ruckus the provincial assembly passed a resolution of Pakistan People’s Party leader Nisar Khuhro’s resolution against using abusive language against Speaker. Deputy Speaker Shehla Raza requested the opposition leaders to keep silence but they chanted “Shame, Shame”.